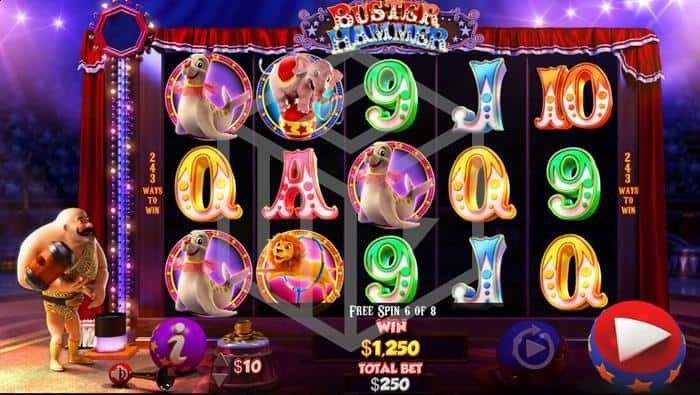 Buster Hammer is an August 2016 collaboration between Chance Interactive and NextGen Gaming which takes on a circus theme and plays out inside a big top. Victorian Strongman, Buster, watches over proceedings ready to wield his mighty hammer and help bring big wins to the paying punters. Buster Hammer is a 243 ways to pay medium volatility slot featuring hammer multipliers and free spins with extra wild multipliers. With an RTP of 95.89% you can spin the reels on this game from €0.25 to €625 per spin. 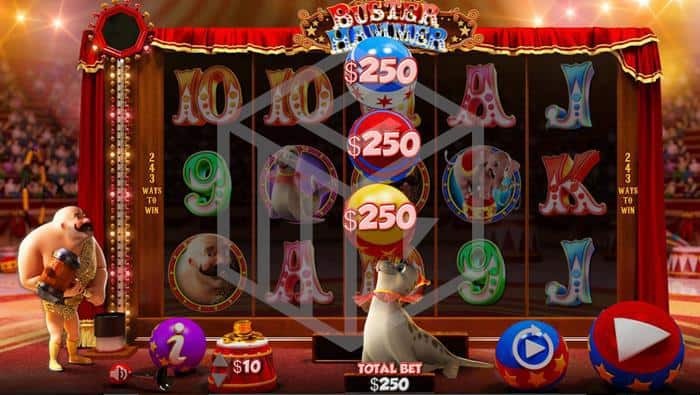 Buster Hammer is a great looking slot packed with bright and colourful 3D animations set inside a packed big top circus. The game board takes centre stage draped in red velvet curtains with the varied and colourful symbols on a dark translucent background. Buster stands to the left of the game board dressed in his fetching leopard skin strongman garb, complete with shiny bald head, bulging muscles, handlebar moustache and hammer ready to swing for the illuminated ‘test your strength’ meter. The circus action is ably accompanied by a jaunty circus backing track. As to the symbols, the low values are represented by the standard 9-A playing cards in colourful circus fonts while the higher value symbols are cartoon images of a Lion, an Elephant, a Seal and Buster the Strongman as the highest paying symbol. The wild is a hammer (which also acts as a multiplier) and the scatter is the game’s logo. 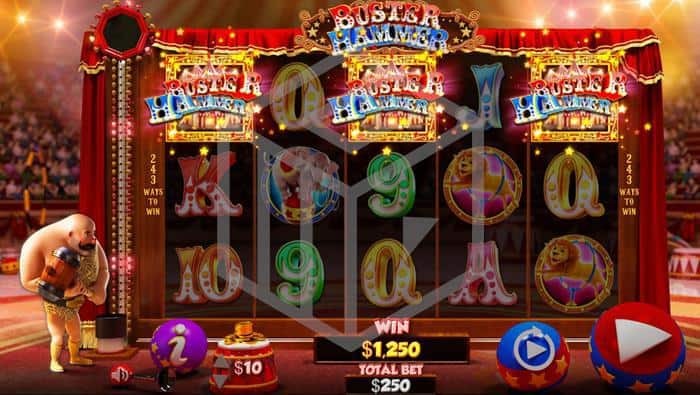 The slot offers a randomly triggered“Super Seal” base game feature while the Wild Hammer feature brings multipliers to wins in both the base and the bonus games. The bonus game feature is the a free spin round which offers the player a choice of spins and multipliers depending on what the player feels is the best combo for them. In Buster Hammer the Wild is more than just your average wild and when that hammer lands in conjunction with a winning spin then it’s over to Buster to swing his mighty mallet down onto the ‘test your strength’ meter. The power with which he connects determines how big a multiplier will be added to your win and it can be anything between 1x and 5x. If more than one hammer lands in conjunction with a win then Buster will swing twice (once for each hammer) and the multipliers earned will be added together and multiplied by the initial win. Theoretically if you land three hammers all with a 5x multiplier after choosing 4 free spins quintupled this could add up to a huge 75x win multiplier. Unfortunately there is no way of retriggering free spins. At any point during the base game a big cartoon seal might stroll out into the centre of the screen and balance a number of balls on the end of its nose, with each ball containing a cash prize. Depending on whether the hammer multipliers are involved these could pay out up to 75x your stake. Buster Hammer has just the right balance of great design, innovative features and decent win potential. It really is a great looking slot and, for a medium/high volatility slot offers enough in the way of features to counter the inevitable dead-spin periods. Any game with free spins and multipliers is always a winner as far as I’m concerned, and during test play I managed to hit several very decent scores. Perhaps Chance Interactive could have made this game maybe a little more volatile to really attract the serious gamers, but then again with such an attractive and fun looking slot you don’t want to scare off those rec players either, so maybe the middle-ground is where this slot belongs. Either way I can thoroughly recommend Buster Hammer as a great one to give a try.